They say ‘A picture is worth a thousand words’. Social media has made it possible for us to share our most cherished moments and memories with our near and dear ones. This is the reason for Instagram, a social network for sharing images, being such a hit. However, the modern tech savvy generation felt the need to further improve upon the impact of a single photograph and that’s where collages came in. A collage is a combination of multiple photos placed in various layouts based on the tastes of the creator of the collage. Though Instagram does not have an inbuilt feature that supports creation of collages, there are several apps that have come up both for iOS and Android that allow you to create some magnificent collages from a set of images. You can share these collages seamlessly with your followers and friends on Instagram. Recently Instagram has introduced a new app Layout for Instagram that allows sharing your collages directly to your Facebook account without having to use Instagram as an intermediary. We have listed other popular apps that can get you fantastic collages for Instagram, however Layout by Instagram is by far the best way to bundle up and share your precious memories. The foremost thing to do is to select the images that you want to feature in your collage. You can go to your camera roll or gallery through the app and then select the various photos of your choice. Upon selection, the photographs automatically display in various layouts at the top of the app. While this might seem unnecessary for those with an artist’s soul, such help can prove invaluable for those of us struggling to come up with just the right look. With the aid of a visual it is fairly easy to select the layout of your choice from the array displayed. Once you have done so the next step is to edit the size and placement of your photographs. The app also allows mirroring images or even flipping them upside down; a great way to sneak in a bit of humor into your masterpiece. Once you have placed the selected photographs in the array of your choice, you can go ahead and save the image and then export it to your camera roll or gallery. The image can then be shared with Instagram or Facebook directly. What Makes the Layout App Better Than the Rest? 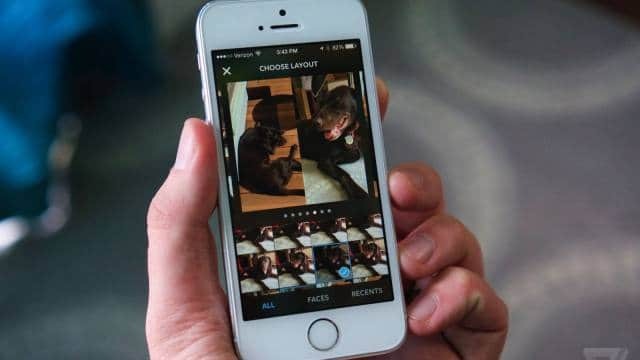 Instagram has multiple collage creating apps to choose from for the Android and iOS users. However, in all the apps you need to have an Instagram account in order to load your collage into Instagram and then share it. Layout does away with this extra layer and allows you to share your collages directly with Facebook even if you do not have an Instagram account. The app has some cool filtering features as well, that makes the creation of collages easier. It has a filter that allows it to detect photographs which have faces in them. Instagram has found that, statistically 90 percent of the collages uploaded onto it have photographs of people and not places. Thus, the ability to browse only through photos which have faces in them comes in handy when creating collages. Another distinguishing feature of this app is its lack of borders. Most of such photo editors generally separate the snaps with a white border. This can ruin the effect that you are trying to create. Layout allows you to create a flawless collection that has no borders with one photograph seamlessly flowing into the other. 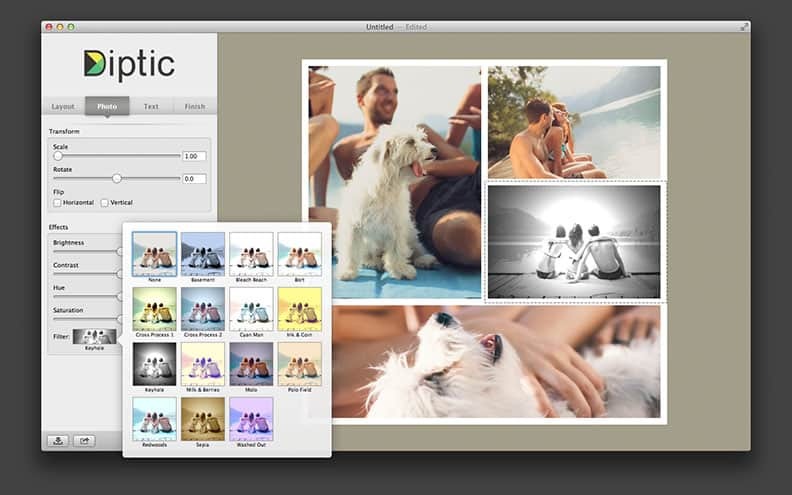 Thus, if you are looking for an easy way to come up with picture perfect photo collages then Layout is definitely for you. Layout was launched in March this year but was available only for iOS. Thanks to its popularity Instagram launched the app for Android as well in May. Another exclusive feature boasted by this app is that of clicking photos booth style. Using this app it is possible to click 4 snaps one after the other of your face using the front camera of the phone. This is a great way to portray your reaction to a certain event in a frame by frame collage. There are a few things which are not possible on Layout. There’s no option for adding captions to images in this app nor can you tweak the image in any manner apart from mirroring it or flipping it. While these are not important for most people creating collages if you are among those who like to label their images or create memes that require adding text to images then you may have to look beyond Layout. This app is available for both iOS and Android and would work for you if you are looking for a playful collage with emoji’s and fun fonts. This is not for the stoic though; this app with its hearts and stars and weird shapes is better suited for the young ‘uns. This is another popular app with millions of Android and iOS user. This app allows video editing as well and has an additional freestyle collage feature wherein you can come up with your own custom layout. Thousands of existing designs and stickers make it fun to play with this app but unless you know what you are doing it is easy to get lost here. The app also has several banner ads that sneak up on you when you least expect them. This app is available for $.99 for both iOS and Android. 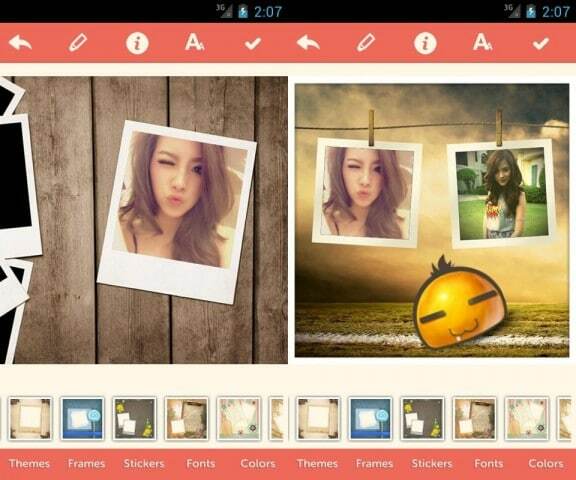 This app has numerous features that make creating varied collages easy and fun. The only negative here is that this is not a free app. 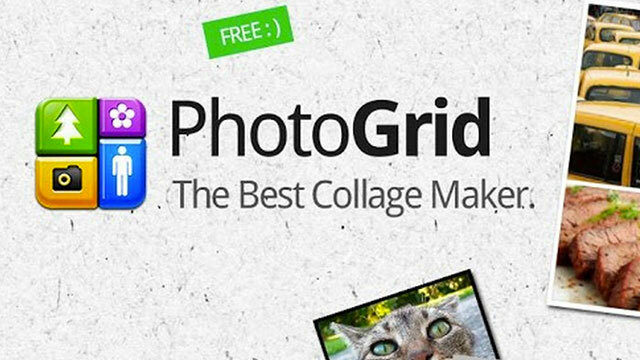 Of these, the most simple and no-frill app to create photo collages is Layout, hands down. Do give it a spin and create collages from you last beach vacation. Let us know in the comments below how was your experience with the app and if you found any better alternatives.